Do you need a new dining set, but don't want to invest in one just to watch it become worn and scratched? High-quality indoor dining furniture can be very expensive and if you have children, the table and chairs may not be nearly durable enough to withstand them. So what options are left to ensuring that your dining set stays nice? Well, you could attempt to make the table a no-play zone, but the kitchen is the center of the home, the landing zone for all things crafts, drawing, painting, coloring and yes, at times, playing. So before you just resign the beautiful table you spent hours picking out on the show floor to a series of crayon, pencil, glue, marker and paint as well as scratches and dents, consider a much more durable and just as beautiful patio dining set. Not ready to take the step yet? 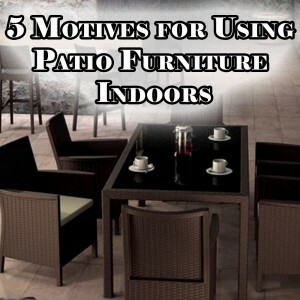 There are many reasons that make patio dining sets a great choice for indoor furniture. These are: durability, modern-day style, price, and environmentally friendly materials. Outdoor dining tables and chairs are engineered to withstand the elements and take a beating. 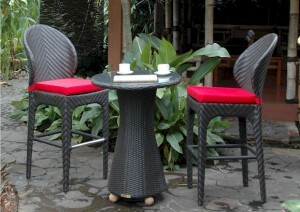 Plus, the outdoor fabrics the seats are made with are easy to maintain. Because of the dying process that goes into the fabrics, the seat cushions are able to withstand fading for longer than traditional fabrics. Plus cleaning the seat cushions are as easy as wiping it off with a rag or, in times of major staining you can use a mild detergent. Unlike the cheap plastic or metal al fresco dining sets of the past, present day patio furniture is designed with both beauty and durability in mind. In some cases, house guests may not even be able to tell that your dining set is actually outdoor furniture. You can easily fool guests with cedar outdoor sets, resin wicker, Polywood or even metal outdoor furniture sets with cushioned chairs. A lot of indoor sets are made from the same materials but are not engineered to be nearly as durable. 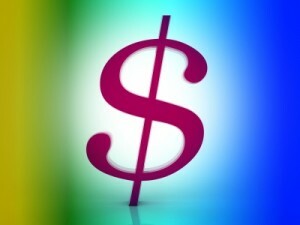 On top of all the material choices you have the style choices are abundant as well. Choose from square, round, rectangular tables. Tables with tempered glass tops, decorative leg work and cottage style resin-wicker. 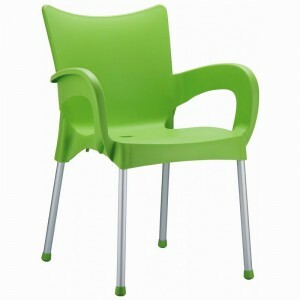 You can also choose dining chairs from a variety of styles. Arm chairs, side chairs, benches. Like with traditional dining chairs, outdoor dining chairs can be cushioned with deep seating cushions that are removable and washable (a definite plus for families that are busy and/or have children). When compared to high quality indoor dining furniture there is a lot of room for savings if you choose to go the patio dining set route. Also, outdoor dining furniture is sure to outlast indoor designs that are more prone to wear and tear over time because of their durability and being crafted to withstand outdoor elements. You can feel good about your choices when you decide to go with an option that is environmentally-conscious. 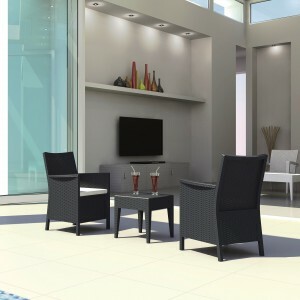 While there are eco-friendly options for traditional furnishings, items like Polyethylene Synthetic Wicker (resin wicker) is completely recyclable and is non-toxic. 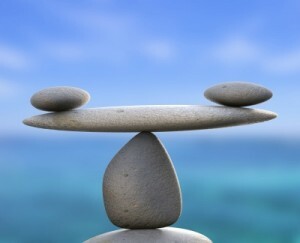 This means that it will do no harm to the environment. In addition, patio seating sets also make great choices for sunrooms and sleeping porches with the endless styles, durability and material options. You can choose from chaise loungers, sectionals, sofas, loveseats, arm chairs, rocking chairs and lounge chairs as well as coffee and end tables. With all the stunning ever-evolving designs, myriads of patterned fabric coverings, and durability of patio furniture, the options are endless and nothing is sacrificed in terms of style and usage when you place these furnishings indoors. *Please note that while most patio furniture is generally rated for indoor/outdoor use; always check the tags and labels on the furniture to make sure that it passes flammability tests. For more information or to view other decor ideas, visit us at Serenity Health & Home Decor.